If you are using PRMS and would like to implement your e-business initiative, don't keep waiting. Datanational's e-business solutions for PRMS will enable you to extend your desired PRMS applications to the Internet to your customers, suppliers, employees, sales or field force. Datanational specializes in e-Business integration services for PRMS. Whether it's providing your sales force with timely information in the field, providing suppliers with on-line visibility of their purchase orders, or enabling your customers to purchase products over the web, Datanational will provide a proven solutions for you! We are a company that provides "turn-key" solutions. We understand the importance of providing a solution that fully integrates with your existing systems. We will work closely with your project team to design, deliver, test, launch and support your solution. The Portal resides on a web server that is hosted and managed around the clock by Datanational's technical support team, or it can be placed at your site on one of your servers. Our specialists have worked with many versions and releases of the PRMS product for over fifteen years. During this time, we have developed significant areas of expertise with PRMS. Our experience, diverse skill set and hands-on approach with PRMS provide us with the ability to successfully deliver projects based on our customer's specific needs. Depending on your needs, we offer a Customer Portal and Supplier Portal. With Datanational's eConnect Customer Portal for PRMS, you can focus your resources on solutions that will increase your top-line revenue growth by providing improvements to Customer Service in order to create new sales opportunities. You will have a very effective business tool to provide increased customer service while reducing customer service labor hours and cost. 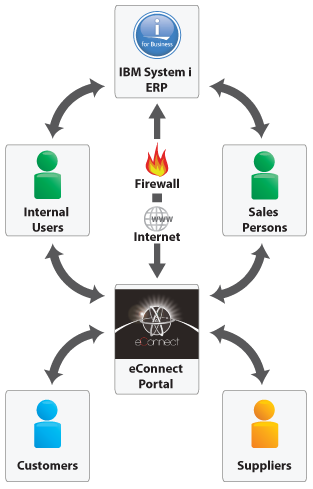 With Datanational's eConnect Supplier Portal for PRMS, you will deliver on-line visibility of purchase orders on your system to your suppliers in a secure, web-based portal. In addition to a web-based purchase order inquiry, your authorized suppliers can also electronically acknowledge purchase orders, update scheduled delivery times, update product lead times and report shipments against their scheduled purchase orders or even the individual PO lines.